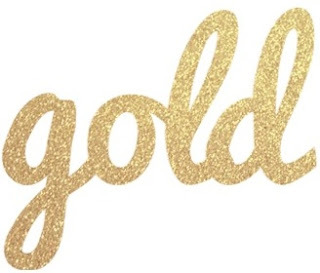 Gold is a classic go-to color. 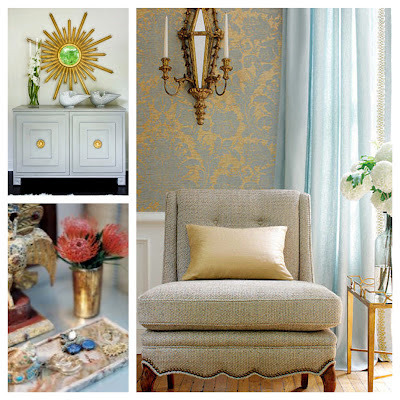 And, although I have a lot of silver accessories in my home, I love gold accents. I remember a time when I thought mixing metals was bad-now I pile on my gold and silver studded friendship bracelets carelessly. And, my silver skull sits pretty next to a pink and gold vase. In addition to gold for the home, I love it in fashion...but bigger and brighter. My current go-to nail polish is Butter London gold glitter. It is much easier to get off than other glitter polishes and seems to stay on a while. And, if you follow fashion news, you probably have seen Carey Mulligan in Prada from the Met Gala last night (below)...she was even trending on Twitter! Gold was everywhere on the red carpet. My other current gold style favorite is nameplate necklace. I just wish I could find mine I bought at Walgreens years and years ago.